This week the new project on the design wall is my Improv Tumbler that I'm making for my Island Batik Ambassador "Whimsical and Wonky" challenge this month. All of my fabrics are from the Paisley Dot Brights 10" stack (provided to me by Island Batik). I'm going for a color wash effect. I was able to get all of my whole tumblers onto the wall. I have a pile of half tumblers that I will use to fill in the ends of each row and perhaps piece together to fill in if needed. These improv tumblers were cut freehand with a rotary cutter, without the use of a ruler or template. I look forward to starting to get this one sewn together. It's shown on a 48" wide design wall, so I expect it will shrink up up around 36" wide. Edited to add: A little more on this project can be found in this earlier post. And it's based on my Improv Tumbler Mini (which I miss). Posted in Quilting. Tags: Island Batik, Island Batik Ambassador, planned improv, sew the rainbow on December 5, 2018 by sarah. I like the idea of these improv tumblers. I think it suits the fabric. Thank you, Lissa. 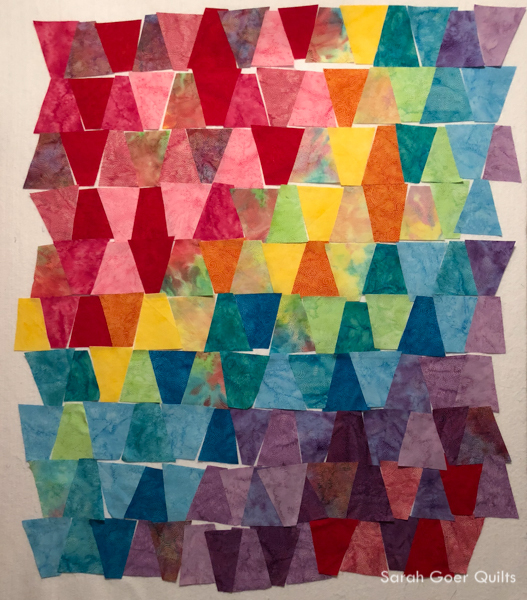 The batiks are a wonderful choice for color wash quilts. But I think my next improv tumbler project may be in solids. So many options! It's amazing how much angles will shrink up when pieced. Do you have any ideas or plans for where this will be used when it is finished? It's going to be such a bright and happy quilt! No idea! I rarely have a plan when I start a quilt. We’ll see how I’m feeling as it gets pieced together. Maybe I’ll find a wall for it in my house. ;-) Thanks for visiting, Yvonne. I can't wait to see how this turns out! So far, I love the idea, though if I do it, I will use mostly blues. I have moved to Sacramento County and miss my quilting friends. I need to get quilting again. Thank you, Johanna. There are many guilds up in the Sacramento area. Have you found out which are neat enough for you to visit? The layout looks great. I'm intrigued by the fact that you improv cut them. Can't wait to see how it progresses. I'm glad I've intrigued you. I hope to show some piecing progress soon. ;-) Thanks for visiting, Anja. That looks great on the design wall, and somehow very colorwash-y. I was playing with some more structured, fractured things the other day and look forward to seeing how this comes together! Thank you, Kathleen. I've long admired color wash quilts and it's been fun to work on a couple this year. Your projects sound interesting. Have fun!